Advances in Bioorganometallic Chemistry examines the synthesis, structure and reactivity of bioorganometallics, their pharmaceutical applications, hydrogenase, vitamin B12-like systems and metalloproteins. It is written by the top researchers in the field and compiled by editors Toshikazu Hirao and Toshiyuki Moriuchi. Developments in this relatively new field of bioorganometallic chemistry, a hybrid between biochemistry and organometallic chemistry, happen very quickly and this comprehensive reference offers the latest research and findings in the field. Features a discussion of the synthesis, structure and reactivity of bioorganometallics, and an examination of hydrogenase-like systems, which were designed to demonstrate catalytic activities and functional properties. Also includes a discussion of bioorganometallics as they relate to medicinal chemistry, specifically applications of metalloproteins, metalloenzymes and applications in bioimaging. 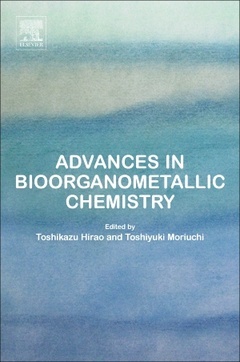 The book concludes with coverage of vitamin B12-like systems, including the latest developments in derivatives designed to perform bio-inspired catalytic reactions. This work is a valuable resource for chemists working in organometallics and biochemistry, including biochemists, bioorganic chemists, bioinorganic chemists, as well as pharmaceutical scientists, medicinal chemists and students studying in these areas.